Your garage is an extension of your home. You want it to look its best and be secure. Glenview homeowners have a few options when they need garage door services, but one choice stands out above the rest: Overhead Garage Door. 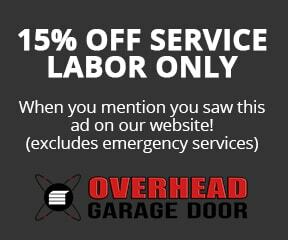 With 45 years of experience, the professional team at Overhead Garage Door can provide what you need. They can install a new garage door for your home, or fix a malfunctioning or broken garage door. We also provide garage door opener installation, replacement and repair. We have a variety of styles to meet any custom garage door needs. We handle commercial garage door and residential garage door installation and repair, so we can improve the look of your business or home through a unique garage door. We can give you a traditional wood garage door for a classic look or a modern steel garage door if that is a better fit for your home’s style. Whether you need a complete new garage door or just a section of a garage door replaced, we can help you. Don’t hesitate to get professional service for your garage. We can make sure you have up-to-date parts, from springs and cables to hinges and tracks. We are your source for Glenview garage door repair and installation services. Call Overhead Garage Door today for a free estimate!